With my maternity leave approaching, I wanted to give my ASOS maternity pencil skirts one last wear in the office. They've lasted me well, through two pregnancies. The black and white prints gave me more chance to play along with the #SNScolour challenge on Instagram too. The style challenge for the day was metallics. While I have a metallic tee, I certainly can't fit it in the third trimester! I decided to use accessories for this, with the silver necklace, Balenciaga wrap bracelet and studded mouse flats. I had a quite day in the office without a lot of meetings so a simple tee and pencil skirt outfit was perfect. Last worn: green maternity tee, graphic print maternity pencil skirt, studded mouse flats, Rebecca Minkoff MAM bag. Other ways to wear: green maternity tee and skinny jeans, graphic print pencil skirt and grey tee, studded mouse flats and a printed wrap dress, Rebecca Minkoff MAM bag and a red leopard print dress. The style challenge for the day was white, so it seemed obvious to wear my white maternity tank. I did worry it would be a little too casual for the office, so added the blazer over the top. I'm looking forward to wearing this blazer more when the autumn weather finally hits Brisbane and it cools down a little! It's great to have a cover-up in the office air-conditioning though. The blazer is a spring item from 2014 I picked up in the Jeanswest outlet last year but it's the perfect pastel pink to be classed as 'Rose Quartz', one of the colours of the year everyone is raving about. I felt the statement necklace was a nice touch with this outfit - added some colour and sparkle so it didn't look too dull. This ended up being one of my favourite pregnancy office outfits, so a nice way to say farewell to this skirt. Last worn: pink boyfriend blazer, white maternity tank, Asos tartan pencil skirt, two tone flats, Rebecca Minkoff MAM (above). Other ways to wear: pink boyfriend blazer and denim shorts, white maternity tank and a printed kimono, Asos tartan pencil skirt layered up for a rainy day, cap toe flats and skinny jeans, Rebecca Minkoff MAM and a maxi skirt. Linking up with Hello Monday, Modest Monday, On Trend, Style Sessions, Turning Heads, Confident Twosday. I love that color blue with the black and white skirt! And I love that blazer! Your outfits are always on point! You have the best bags. How long of a mat leave do you get? Love the second outfit, Mica! That blazer was the perfect addition to the outfit. you're almost there! i love the skirts. very cute! You would look great in a pencil skirt! I do tend to save mine for the office though, I'm not one of those people that's very successful at wearing them casually! That's great the asos skirts have lasted you through the pregnancies! Thye are very cute. I've been on the hunt for some black & white printed skirts for the office - they pair well with so many things! I love how you paired it with pastels, great inspiration for us going into spring! Definitely checking out ASOS now! ASOS have some great pencil skirts! I have a few non-maternity ones from there too. Love your looks! And I love your bag. So classic! That second outfit is amazing! (well both outfits are amazing) but the second one is something I would totally wear to work myself - and I'm not even pregnant! It would work well without the baby bump I think! It is a great colour! And yep, not long to go now! I always love your looks with the pencil skirts--they're just such fun pieces. The second look is my favorite because I just LOVE that pale pink blazer. I really want more of that color in my closet! Yep definitely welcoming the maternity leave! Really love your grey flats in the first look...and the blush pink blazer in the second is pretty, too!!! Rockin' the pregnant corporate style! I had never really given ASOS a thought in terms of maternity wear before. I do love those pencil skirts on you though, and I LOVE that top skirt print every time you wear it! You always look so comfortable in your work clothes. How long is maternity leave in Australia? ASOS do great maternity wear! :) We get up to 2 years leave in Australia luckily. Maternity leave already!?!? Where has the time gone. Yep, it has flown by this pregnancy! I certainly have, got a lot of wear out of them! I love the pencil skirts! Adding a printed piece can really make your outfit pop! I love both pairings, but my favorite is the 2nd! I LOVE blush pink on you! It looks so lovely with the skirt, as well as that beautiful necklace! Almost time to meet baby, I know you must be so excited! I hope you're having a great day and start to your week so far, beautiful! Of course, both of these outfits are great but I have to say the second one is my favorite. Especially the color of the blazer - I feel like I see either the basics (white, black) or bold colors for blazers, so the pastel is a nice change up and it matches so well with the necklace! You are adorable. Both those skirts look amazing on you! You have wonderful maternity style! Love how you styled both of these skirts. Great outfit. You have pulled it off well. I love your Rebecca Minkoff bag too.. I really love the pattern skirt in your 2nd outfit, and how you paired it with the pink blazer. So chic and pretty! Hope you have a great week ahead beauty. 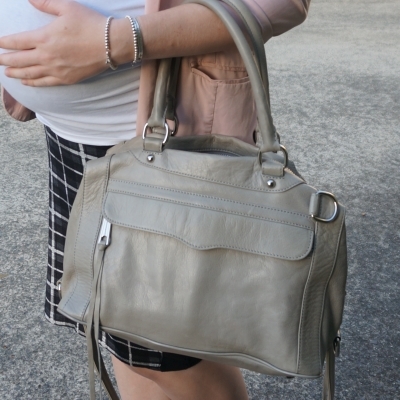 i always struggled with wearing pencil skirts while pregnant but love how these look on you! great prints! These maternity pencil skirts have been great for pregnancy! Love the looks but the second is my favorite. That blazer is just the perfect colour. You are one chic mommy. The skirts are so stylish and fashionable. :) I must check the side to find the second one, becuase the second outfit is my fav. You look great and a lot of healthy for you, my dear. :)! You are looking more and more gorgeous each day! Love both the pairings! Loving the necklaces in both looks, especially the second one! These flats are too cute! The first outfit is my favorite, the print on the skirt is great. I rarely wear pencil skirts, pregnant or not, don't know why, to be honest, as they are so elegant. They are great, but I have a hard time wearing them outside the office! Both of these outfits are really great on you! pretty! Such perfect looks!! The leather wrap bracelet you have on in the first outfit is great!! I have always wondered about ASOS maternity! Good to know for when that day comes! I highly recommend them, great pieces! Those skirts are so gorgeous! I love how you kept them both simple, yet they still look so chic! I love ASOS- and I've heard great things about their maternity line! Both of these skirts are amazing! I love the bold patterns on them! That mint tee is so pretty! It's almost time for baby! I love the soft colors you've added in both outfits with your top and blazer. It really takes these skirts to spring. They are so versatile and you've styled them so many cute ways! Man, every time I see your maternity posts it makes me cringe at how unfashionable I was when I was pregnant. You’re so damn stylish & I love those skirts on you. They look really comfortable too. Pregnancy dressing is hard! I'm glad to have picked up a few stylish pieces! Love rose quartz and grey together and that awesome necklace gives it such a nice pop! You are totally all baby!!! Great outfits, love the skirt! I love the pastel colors you are wearing, very Spring.The patterned skirts look very stylish with them as well. Yes to flats! These outfits are lovely, it's great to see you can still maintain a smart look even whilst pregnant. I'd imagine that I would just turn into a slob and wear slacks all the time!